2013 April « Hercules and the umpire. Photo credit: Abi Skipp’s photostream (Isle of Wright 2009) per Creative Commons license. Two things make me want to put a gun in my mouth. They are bankruptcy appeals and patent disputes. In this post, I concentrate on bankruptcy cases. Thirty years ago, I used to do quit a bit of bankruptcy work when I practiced law out in the sticks. I made $50 bucks an hour representing agricultural lenders during the farm crisis of the early ’80s. My job was take farms and ranches away from farmers and ranchers. Not tons of fun, but interesting. I remember spending lots of time in the federal courthouse in North Platte, Nebraska, waiting for Judge Tim Mahoney to hear my case. The judge–a truly wonderful guy and a great judge–worked late into the night hearing farm credit cases. No matter how long he had been on the bench that day, he was always patient, smart, funny and a joy to practice before. Happily, most of the time, I was in a superior legal and bargaining position, so I “won” fairly frequently. But, truth be told, I privately thought that a monkey could have done just as well as I did. 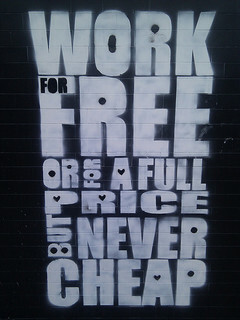 Nonetheless, I took my fifty bucks an hour and never looked back. Bankruptcy Appellate Panels are 3-judge panels authorized to hear appeals of bankruptcy court decisions. These panels are a unit of the federal courts of appeals. Bankruptcy Appellate Panels (BAPs) were established under the Bankruptcy Reform Acts of 1978 and 1994. 28 U.S.C. §158 sets forth jurisdiction for appeals of bankruptcy decisions and authorizes the establishment of BAPs upon the order of the circuit judicial councils. BAP judges continue to serve as active bankruptcy judges in addition to their duties on the appellate panel. Appeals from dispositive orders of bankruptcy judges may be taken to the district court or the BAP (if one has been established and the district has chosen to participate), with further appeal as of right to the court of appeals for the circuit. In accordance with requirements of federal statutes and procedural rules, parties may elect to file an appeal of a bankruptcy court decision with the BAP or with the district court. 1st, 6th, 8th, 9th, and 10th Circuits. Bankruptcy Appellate Panels, United States Courts. With the advent of the BAP, almost all bankruptcy appeals in Nebraska go to the BAP. From my perspective, that is as it should be. The BAP–composed of very experienced bankruptcy judges–is more able than I am to process bankruptcy appeals in a timely and efficient manner. I am fortunate to be in a place where bankruptcy practitioners and their clients have the option of proceeding before the district court or before the BAP when they prosecute appeals. This brings me to a related point. On the criminal side of things, federal district judges are specialists. After all, for federal criminal cases, we are the only game in town and we have to become specialists. On the civil side, that has never been the common view. Rather, federal district judges, when dealing with civil cases, have generally be seen as generalists. We handle diversity cases involving state law, and all manner of federal questions. We are reasonably good at handling most things that come in the door. I am persuaded that the generalist model for the handling of civil cases in the federal district courts is a good thing except when it isn’t. As our legal systems evolve, we are likely to find more efficient and less costly ways of resolving certain types of disputes by increasingly looking to specialist tribunals. 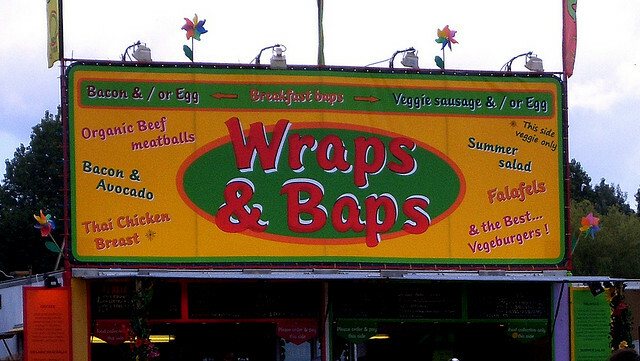 In my view, the BAP experience proves the efficacy of that idea. I took Tim’s photo today. It is appended to this post. 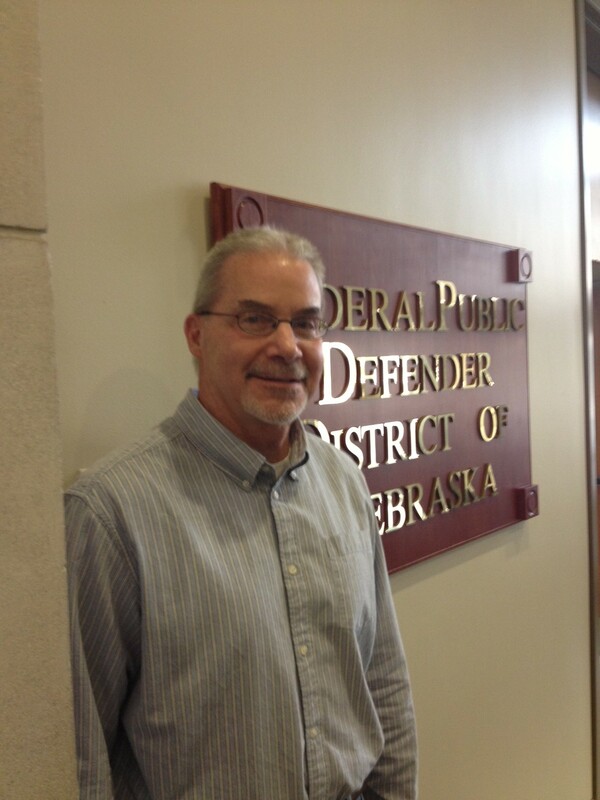 He is the most experienced and senior investigator for the Nebraska Federal Public Defender’s office. After 18 years of serving the impoverished clients of the FPD (and years of experience before that as a Lieutenant in a metropolitan police force), Tim’s last day is April 30, 2013. Out he goes. Tim takes with him, and thus deprives the FPD’s clients of, the highest level of skill, wisdom, integrity and common decency that one can imagine. This is the real face of the sequester, and it is a tragic one. [T]he right of self-representation has been protected by statute since the beginnings of our Nation. Section 35 of the Judiciary Act of 1789, 1 Stat. 73, 92, enacted by the First Congress and signed by President Washington one day before the Sixth Amendment was proposed, provided that “in all the courts of the United States, the parties may plead and manage their own causes personally or by the assistance of . . . counsel . . . .” The right is currently codified in 28 U.S.C. 1654. Faretta v. California, 422 U.S. 806, 812-813 (1975). One of the purposes of this blog is to realistically describe what goes on in the life of a federal district judge. In this post, I write about the hidden challenge of dealing with pro se cases. At the beginning of their chapter on federal district judges, Epstein, Landes and Posner write that a “substantial fraction of cases filed in the district courts (many by persons who do not have legal representation) have no possible merit and so really are just noise in the data.” Lee Epstein, William M. Landes and Richard A. Posner, The Behavior of Federal Judges A Theoretical and Empirical Study of Rational Choice, at p. 207, Harvard University Press (January 2013) (emphasis added). While they are correct to say that pro se cases often lack merit and, from the perspective of a social scientist, might fairly be dismissed for empirical purposes, a federal district judge cannot so easily ignore that class of cases. If pro se cases were only a small fraction of the caseload, there would be nothing to worry about. But that is not the case. I estimate that pro se cases comprise 25% of the typical civil docket of the typical federal judge. That’s right, 1 in 4 civil cases are pro se. Many believe the real ratio exceeds 1 in 3. See, e.g., Kory Schneider, Illiberal Construction of Pros Se Pleadings, 159 University of Pennsylvania Law Review 585, 592 (2011) (37%). The federal judiciary has reacted to this massive case load by devoting substantial resources to pro se cases. In 2013, the judiciary will allocate funding for 328 pro se staff lawyers* each working an assumed 1,763.04 hours per year on cases. Memorandum from the Director of the Administrative Office of the United States Courts to District Chief Judges, FISCAL YEAR 2013 PRO SE LAW CLERK ALLOCATION, (October 22, 2012). On average, pro se prisoner civil rights cases are assumed to take 13.4 hours of the lawyer’s time, and pro se habeas corpus cases are assumed to take 8.3 hours. Although one could define the pro se docket to include any civil case filed by a pro se party, the conventional way federal courts define the pro se docket is to key on whether the person filing the complaint or petition is or was a prisoner. Note that habeas petitions challenging state convictions and section 2255 motions challenging federal convictions are civil in nature even though a criminal conviction is at the heart of the dispute. I manage the pro se docket for the District of Nebraska, and supervise our two pro se staff lawyers. Gabi and Ryan are our pro se staff lawyers. 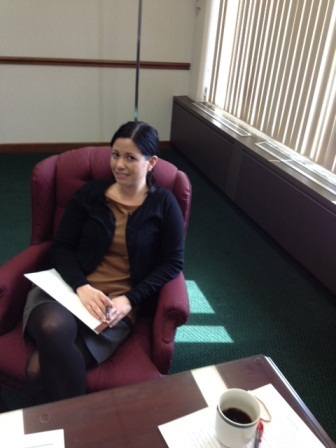 (Gabi, the lead pro se staff attorney, is pictured above.) Both graduated law school with top grades. They are great lawyers and wonderful writers. ** Unfortunately, and as a result of the budget disaster, Ryan (like 37 other pro se staff lawyers nationwide) has been rewarded for his five years of hard work with a pink slip, effective December 31, 2013. The job of pro se staff lawyers (sometimes called pro se law clerks) is to work with the judges to manage and resolve the huge but hidden caseload that is the pro se docket. Unlike the typical law clerk, pro se staff lawyers are specialists who often intend on making a career of working for the federal courts. They must keep up on and master arcane aspects of federal law. Because much of their work also involves questions of deference and comity with respect to the state courts, pro se law clerks become experts on state procedural law. Additionally, they must act as case managers constantly worrying about such things as progression orders, the age of motions and the time to disposition of cases. These lawyers work under constant and grinding pressure. It is very demanding work. When dealing with the pro se docket, the task of the federal district judge and staff attorney involves finding tiny needles in mountainous haystacks while disposing of the leftover hay in timely manner. 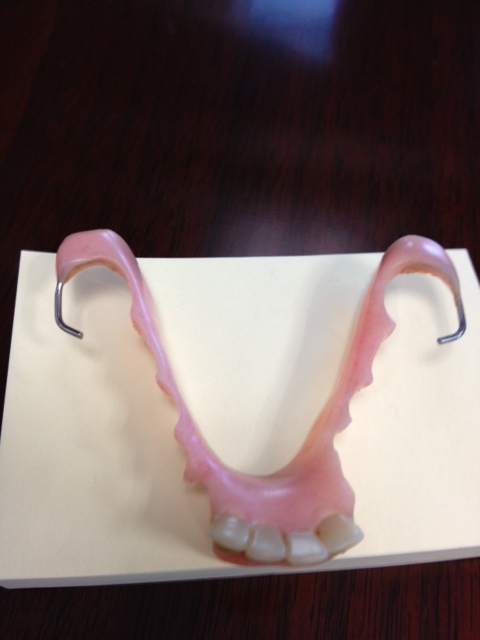 Even though the vast majority of cases are found to lack merit, every case must be treated with care. On the other hand, pro se litigation can do real harm by forcing defendants to expend money to defend the silly. Thus, the judge and the pro se staff attorney must work diligently to see to it that pro se litigants do not abuse the process. Finding the right balance, requires skill and experience. They may only be “noise in the data,” but pro se cases comprise a substantial part of the daily life of a federal district judge and his or her staff. If one wants to understand what federal district judges actually do, knowledge of the pro se docket is essential. *This includes staff lawyers who devote their time exclusively to death penalty cases. **They are also nice people with diverse and interesting backgrounds. For example, and although an American citizen by birth, Gabi, a fluent Spanish speaker, spent her summers as a child with her grandparents in an extremely remote part of Mexico. In her spare time, Gabi loves to read the poetry of Pablo Neruda. I had the privilege of marrying Gabi and Raul. Raul is a lawyer too. What does it really mean to be a “senior status” federal district judge? 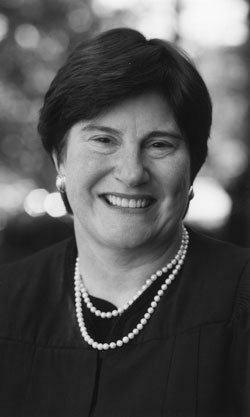 “Ninth Circuit Judge M. Margaret McKeown to Lead Federal Judges Association,” observes Howard Bashman at How Appealing. (7:10 PM post on April 24, 2013). I had the privilege of getting to know the judge when she served as the Chair of the Codes of Conduct Committee for the federal judiciary. She is brilliant. She is a great writer. She is one of the nicest and most interesting people you will ever meet. She has a lovely sense of humor. She is down-to-earth. (Being Made In Wyoming will do that for you.) She has finally tuned people skills. She is universally respected. She was (and is) on a lot of “short lists” for the Supreme Court. She is adventurous–McKeown was a member of the first American mountain climbing expedition to China. Judge McKeown will do a wonderful job leading the FJA during this most challenging time. I wish her well.